what the Executive Committee expressed in mid-April to the Coalition Against Apartheid, which continues to urge MIT to divest from companies doing business in South Africa. The coalition has recently pressured the Corporation to divest through a series of meetings and information exchanges with Corporation members, the most recent being April 4, when CAA members met with members of the Executive Committee, and with Vice President and Secretary of the Corporation Constantine B. Simonides. In its public statement, the Executive Committee also announced its support for international economic sanctions. "The Executive Committee . . . recognizes the constructive role of international economic sanctions in the process of political and economic reform in South Africa. The objective of these sanctions is to abolish apartheid and to establish a representative form of government, and the committee calls for their continuation." President Charles M. Vest, chair of the Executive Committee, sent letters with the statement to Secretary of State James A. Baker III, National Security Adviser Brent Scowcroft and the Massachusetts Congressional delegation. At the informal April 4 meeting, the CAA asked the Executive Committee to: divest from companies directly invested in South Africa, divest from companies identified as "the most blatant examples" of indirect investment in the South African economy, and make a public statement reaffirming MIT's support for economic sanctions until a non-racial democracy has been established in South Africa. Simonides said that the discussions with the CAA members and information they provided was taken into consideration at the April 5 meeting of the Executive Committee. The public statement was the outcome of the Executive Committee meeting, he said. "[It] was a judgment of the Executive Committee that sanctions should continue and that [the committee] should make a statement to that effect." Additionally, Simonides said, the committee reaffirmed its commitment for continuing educational initiatives for advanced study at MIT for black South Africans. According to the Executive Committee statement, two black South African students are currently enrolled in the MIT Graduate School, one in the Department of Economics and one in the Department of Urban Studies and Planning. Sue E. Nissman G said last month that the CAA did not view the discussions as "a trade-off where they can either provide aid [for South African students] or divest." She added, "We think it's great that they're going to make some sort of effort for educational needs in South Africa, but that's not the problem. The problem is apartheid." nor of the MIT community's demands represents a small step for which we thank the Executive Committee." 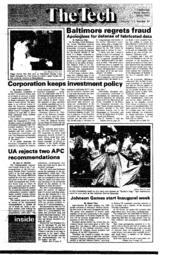 The coalition cited an Undergraduate Association referendum in May 1990 and a petition campaign as evidence of their support from the MIT community for divestment. "However, we feel that the primary demands of the community (the divestment of MIT from companies doing business in South Africa) must be met," the letter continues. The coalition also called on Vest to make a personal public statement in support of holding a binding referendum at MIT to decide "when MIT will divest." The coalition said in the letter that divestment " `maintains international pressures and incentives for constructive change.' Divestment contributes to the erosion of the public image of companies doing business in South Africa and pressures them to encourage the South African government to speed the end of apartheid." But Simonides said, "MIT decided to put its voice . . . directly on the question of supporting the continuance of the sanctions," rather than on divesting from companies with business connections to South Africa. CAA member Ronald W. Francis PhD '90 would not comment on the coalition's plans now that the Executive Committee has announced its intentions publicly. Simonides said that the level of community support did not really determine whether or not to divest from South Africa. "While [the committee members] are welcoming any and all opinions and advice, it isn't really a question of putting [the issue of divestment] to a vote. . . . The coalition is a very active group and has had a lot to say" on the issue, he added. Simonides also said that the profitability of an investment portfolio without a connection to South Africa was "probably not a major reason" for the decision not to divest from companies with ties to South Africa. be appropriate for MIT to not divest." MIT limits its investments to companies with business in South Africa to US companies which adhere to the Statement of Principles, a set of guidelines which call on US corporations with operations in South Africa to abolish racial discrimination in the workplace, to work for an end to apartheid and to improve the quality of life for their employees. Simonides said the policy of investment governed by the Statement of Principles, "has been the policy since 1986 when the Executive Committee formulated it." At that time, the committee said the policy would be reviewed periodically. "With recommendations from the coalition to have such a review, we did at the last two [Executive Committee] meetings -- at the April and May meetings," Simonides said.